I took this picture this evening, it was a beautiful end to the day. Hard to tell from this picture, but a Bald Eagle is perched on a tree, elk are grazing and near me two Canada Geese are hanging out in the water. I watched all this as the Sun set. Another picture from one of my visit to 93 North. Spent much of the first half of the day taking pictures of various locations before going for a hike. I got this picture when it still felt like winter, the morning Sun was hitting the south side of Cascade Mtn.. Now I have to wait until next winter to get a similar picture as Earth changes it relationship toward the Sun. The Sun, the clouds and other weather factors play a big role determining what the picture I'll get and what it will look like. As so often said by photographers, you can never get the same picture twice. Even the mountain is changing, might be hard to see from a distance, unless something dramatic happens like it did in 2013 when large amounts of rain fell and at the same time heavy snow pack melted. Get close enough to Cascade Mtn or sit on top of it and listen to the sound of small rocks and sometimes larger rocks making their way down the mountain every now and then. Nature is dynamic, at smaller and at large scale. A picture taken during one of the cold evening this winter. Standing along the Bow River, where I had found some open water. Lowered the camera enough to get the rocks and snow covered with frost. The clouds were lit up and top of the Castle Mtn with warm light. Lot easier to handle the cold when you get the picture. I headed to 93 North in the morning, with the plans to do some exploring on snowshoes. The temperature was minus 17 in the Town of Banff, when I reached Lake Louise it was minus 23, by Hector Lake pull-off it was minus 16 and by Bow Lake it was down to minus 24. The temperature was too cold for slow walking and exploring, so I decided to go for a drive toward the Columbia Icefield, with the hopes of exploring on my way back with warmer temperatures. It was a beautiful drive, lots of snow on the mountains and the sun shining. I got into black and white landscape mode, stopping and taking pictures from several locations. This one was my favourite from that morning. It was the morning after a good amount of snow had fallen onto Banff National Park. I had the day off and I was out taking pictures of beautiful winter scenery. I have taken many pictures of Castle Mtn from the road, I never get tired of it. For a while it was just me on the road, the few times I stopped along the way to take pictures of the morning light. From the bottom of the valley to the top of the mountain, it's winter wonderland. When driving through the mountains I often comes across beautiful views from the road, I would tell myself I'll take that picture another time. I stop waiting for the next time and started taking those pictures as the opportunities come. I was returning on the Minnewanka Lake Road loop, Cascade Mtn and the surrounding looked great with the snow that fell the night before. 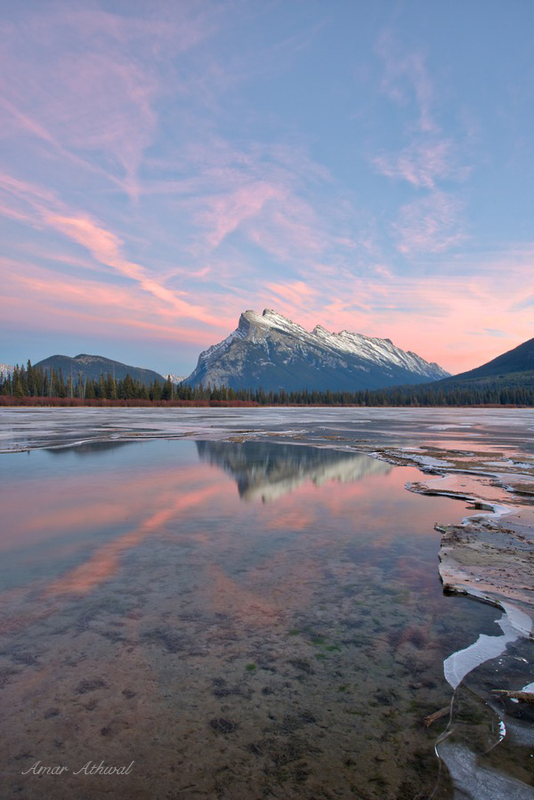 Before the snow arrived I was standing along the Bow River in the evening to take pictures of Castle Mountain. I always look for open water, I found this small pool of water, just what I needed to get the pictures I wanted. I took few variations of the picture being posted, moving slightly left and right, back and forth until getting what I felt was the best picture for me. Many parts of the Bow Valley open water has been covered with ice and due to lack of snow, I have been busy looking for ice bubbles to take pictures of. Checking to make sure the ice was safe enough to stand on and to walk on. Any where organic matter was decomposing releasing methane gas, bubbles were to be found. I found many places, but only few gave me the pictures I wanted. I do lot of exploring by foot, learning about the areas I visit and looking for new photography opportunities. No matter if I have been there before or not, there is always something different to see, During one of my adventure I came across a place to take different view picture of a popular mountain in Banff, Castle Mountain.